What is the Chimera Engine? The Chimera Engine is a real time, fully interactive, play-by-post RPG system that puts customization into the players hands. 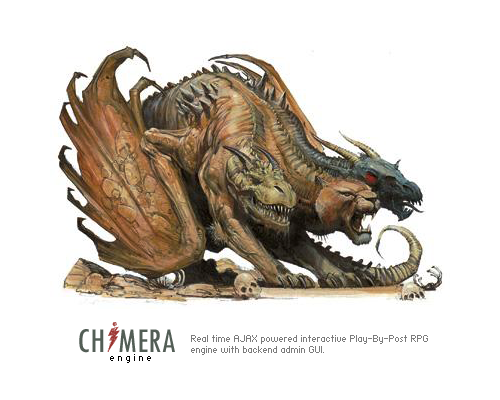 The core functionality of the Chimera Engine is located in a few key areas of a play-by-post RPG. The first area is an interactive character profile that allows the player to make changes to their own character setup without the need of an admin to update, all in real time. The second area is site-wide feature integration to that character profile, be it stat systems, item shops, character datavase, etc these things can now be interactive and allow characters to experience them as they should be. Finally the third area is the fully featured admin control panel that gives admins and updaters the ability to quickly make changes to profiles where admin approval is still required. Does the Chimera Engine take away from Role-Playing? No, it does not and will not. The idea of the Chimera Engine is not to change the Role-Playing we all love, with everything still being forum based in a play-by-post style, but instead to effect all of the things that slow down or make that style of Role-Playing more difficult. For example stat systems, which generally require players to do math and keep track of all their stats with each post, the Chimera Engine will take over that aspect and leave the RPing to the players. I'm building a RPG, how can I get ahold of the Chimera Engine? As of right now the Chimera Engine is in development and thus is not in any state for RPG developers to take advantage of. The long term goal of the Chimera Engine project is to eventually get the engine to a place where it is available in some kind of licensed release. When this happens Chimera Engine will be released as a Wordpress + Simplepress (and likely other Wordpress compatiable forum software) Plugin. It should however be noted that due to the immense amount of work going into the engine it will not be free (with the exception being RPGs I choose to host here on Dystopia Productions, who will always be presented the best software for hosting RPGs). © Copyright 2010 ~ Dystopia Productions "All Rights Reserved"